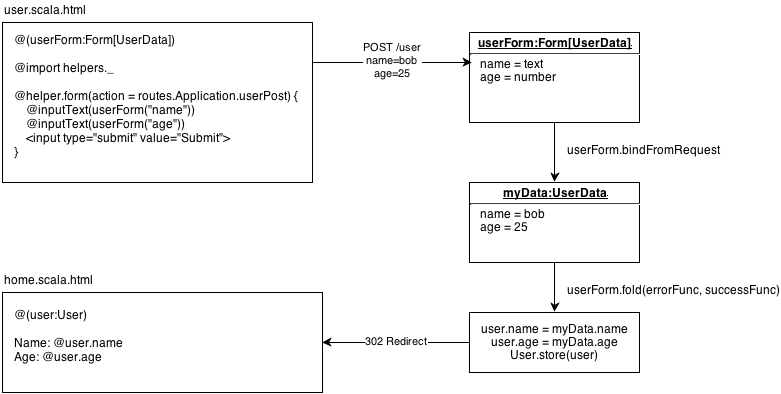 Typically forms are used directly from a BaseController instance. However, Form definitions do not have to match up exactly with case classes or models: they are purely for handling input and it is reasonable to use a distinct Form for a distinct POST. date, sqlDate: maps to java.util.Date, java.sql.Date, optionally takes pattern and timeZone. Note: The source code for each of these templates is defined as Twirl templates under views/helper package, and so the packaged version corresponds to the generated Scala source code. For reference, it can be useful to see the views/helper package on Github. The form helpers above – input, checkbox, and so on – all take MessagesProvider as an implicit parameter. The form handlers need to take MessagesProvider because they need to provide error messages mapped to the language defined in the request. You can see more about Messages in the Internationalization with Messages page. There are two ways to pass in the MessagesProvider object required. This is useful because to use CSRF with forms, both a Request (technically a RequestHeader) and a Messages object must be available to the template. By using a MessagesRequest, which is a WrappedRequest that extends MessagesProvider, only a single implicit parameter needs to be made available to templates. Rather than inject MessagesActionBuilder into your controller, you can also make MessagesActionBuilder be the default Action by extending MessagesAbstractController to incorporate form processing into your controllers. Errors that are not attached to a field can be converted to a string with error.format, which takes an implicit play.api.i18n.Messages instance. The filled value will be selected in the dropdown based on the first value of the pair. And there is no corresponding data for the field. The default value is not used when creating the form. Each form mapping uses an implicitly provided Formatter[T] binder object that performs the conversion of incoming String form data to/from the target data type. For this to work you will need to make an implicit Formatter[java.net.URL] available to perform the data binding/unbinding. Note the Formats.parsing function is used to capture any exceptions thrown in the act of converting a String to target type T and registers a FormError on the form field binding.